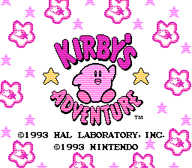 Kirby's Adventure was a brilliant platformer game released for the Nintendo Entertainment System in 1993. It was developed by HAL Labs, a subsidiary of Nintendo that would later go on to make classics like Kirby's Super Star and Super Smash Bros. Satoru Iwata, the current president of Nintendo Company Ltd., and Shigeru Miyamoto, the creator of such series as Super Mario and The Legend of Zelda, were among the notable talents that worked on this game. Kirby's Adventure was filled with colorful graphics, expansive levels, epic boss battles, tons of different power-ups, addictive mini-games, and probably what I'll remember most about the game: catchy, upbeat, and infectious music. I can't remember how many times I used to sit down and play through the game just so I could listen to the different songs. It may very well be the game that got me into listening to video game music in the first place. The game was re-released in 2003 for the Game Boy Advance, entitled Kirby: Nightmare in Dream Land. Nintendo went all out on this remake, updating all of the art and music, as well as adding new minigames and multiplayer play. The Game Boy Advance version is just as addicting as the original NES version. One of the great parts about Kirby's Adventure was that it had cartridge save, which was very much appreciated, because it was a long game. A cool aspect of this was when you completed a certain percentage of the game, you would be given a title, such as Dream Hunter or Son of Wind. When I set out to start this remix collaboration project, I knew exactly how I wanted to approach it; each track on the album would be a character theme for the different ranking the player was awarded. As such, I would end up with 11 character themes in the end. I enlisted the help of some very talented arrangers throughout the video game remixing community, and we've produced something that I hope captures the heroic spirit of the original game.